Adventure Camp is for those campers who are ready for a fully immersed wilderness experience. Campers tent camp each night at Adventure Base Camp located on the outskirts of the camp. As a group, with the support of their counselors, campers will learn to cook their own meals and manage their campsite responsibly in an effort to develop the campers’ consciousness of the impact they have on the natural world around them. Teamwork, cooperation, responsibility, and peer support are just a few of the practical life skills campers will learn at Adventure Camp. Campers spend their days trying out adventure activities such as rock climbing, mountain biking, fishing, canoeing as well as more traditional survival activities such as shelter building, primitive fire starting, and water purification to name a few. 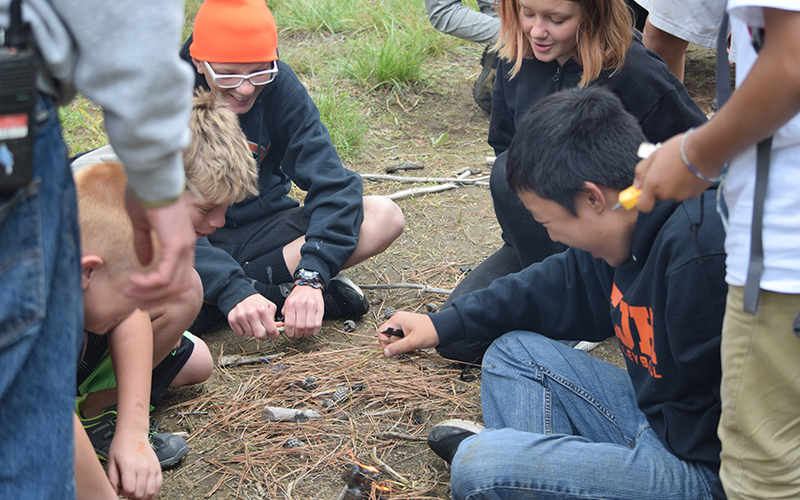 While Adventure Campers spend a majority of their time doing wilderness specific activities they remain connected to our camp community through nightly evening programming and campfire ceremonies.